For the first time in book form, "e;B2B Customer Insight: The Proven Path to Growth,"e; will reveal how customer insight surveys tailored to B2B relationships generate significant strategic data; data that, when properly applied, enables company management to expand their share of existing markets as well as successfully penetrate new ones. When these surveys are regularly conducted and im… plemented, they lead to increased longterm profits and sustainable growth. This book will appeal to virtually anyone wanting to learn about the hidden dynamics of B2B transactions, and how to make those dynamics work in a supplier's favor in their customer relationships and overall business development.In my 20 years of consulting with large manufacturing companies in a variety of industries, I've been able to develop a tested and proven customer insight methodology that I will share for the first time in this book. Utilizing reallife case studies with clients who have agreed to participate in this project, I will also discuss how this research process should never stop with the numbers. Instead, it should provide practical and impactful solutions to specific business dilemmas. 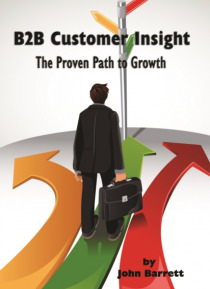 The advantage of offering actual case studies of companies who successfully made significant changes (of course based on our PMG customer insight surveys) will also differentiate us from other B2B business books that lack hard, factbased guidance as well as multiple examples of genuine and significant application.